Capt. 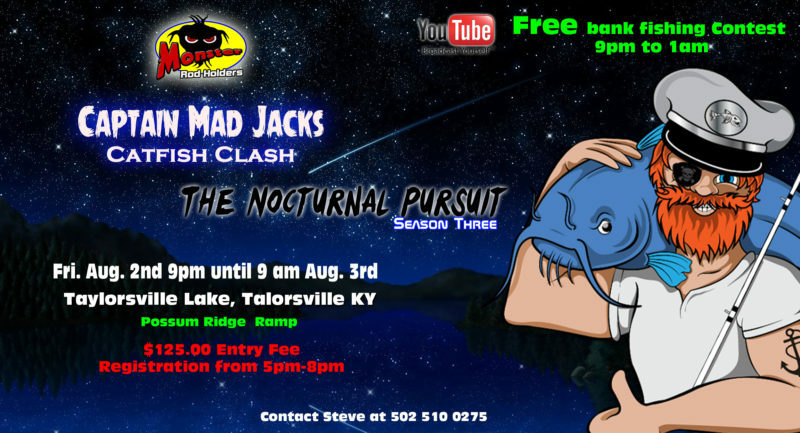 Mad Jacks Catfish Clash, A Catfishing Tournament Event, the Nocturnal Pursuit. This is a PUBLIC event and everyone is welcome to either fish or just hang out and watch as anglers battle it out to show you the biggest monster cats that swim in the depths of Taylorsville lake. Attend the event as a fan or spectator and CLAIM your FREE tickets to win sponsor prizes. Where: Taylorsville lake state park, Possum Ridge boat ramp. When: Friday, August 2nd, and Saturday Agust 3rd, 2019. Registration from 5 pm to 8:30 pm Friday the 3rd BLASTOFF at 9 pm. 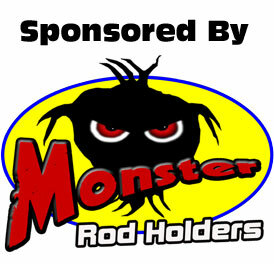 Anglers will fish from 9 pm to 8 am Saturday morning, weigh-in will be at 9 am. Open to the public: Catfishing fans are encouraged to come to meet and greet the anglers from 5 to 8 pm Friday the 2nd and on Saturday morning from 8 am to 11 am. Sponsor prizes will be given away to the public during the weigh-in hours. Stop by on Saturday morning to CLAIM your FREE prize tickets details HERE. The Nocturnal Pursuit. This is a night event, starting at 9 pm on Friday the 2nd and will run through the night until 8 am Saturday morning on the 3rd. Anglers but must be in the weigh-in line by 9 am or be disqualified. Event location is the Possum Ridge Boat Ramp on Taylorsville Lake State Park. Entry Fee is $125.00 per boat and includes big fish pot. Boat numbers are determined by the order in which we receive them. 2 of my concerns are cheating, and fish larger than our live well hit a 52lber. last night and it was too large for the live well, what do we do with those fish weigh them in ? the scales will be open all night. May I enter a kayak? unfortunately not as you must have a live tank large enough to keep your fish alive. Just wondering if there was a person limit on each boat …? And what is the max number of fish that you weigh in …? Max number of fishing poles …..?